New design exclusive to Leisure Pursuits, providing a challenging workout with 8 levels of magnetic resistance and a 2.5kg cast iron flywheel allowing you to pedal forwards and backwards. The heavier flywheel ensures increased resistance, a smoother ride devoid of any jerky movements associated with lighter flywheels. Complete with a large 6 function digital display computer with live pulse readings to monitor performance. Fully adjustable padded seat and backrest offering superb support for the lower back. Side support handles for exercising sitting upright with your back straight. Strong steel chip resistant frame with anti slip pedals. Folds for easy storage when not in use. Exercise bike is certified to EN957 suitable for domestic & home use. Detailed assembly instructions and manual are supplied. FURTHER EMAIL ASSISTANCE CAN BE PROVIDED BEFORE ASSEMBLY AS WE CANNOT ACCEPT RETURN ONCE BIKE HAS BEEN ASSEMBLED. 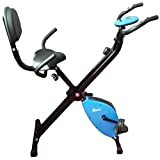 * Contoured handlebars with padded grips * Anti slip pedals, self presenting with adjustable toe straps * Dimensions for use: L87cm x W50cm x H116cm * Weight 18kgs * Dimensions folded: L42cm x W50cm x H134cm * Computer takes 2 x AA batteries (not supplied) * Maximum user weight 100kgs (15.7 Stone) * This is a superb exercise bike for all fitness levels with a smooth and quiet cycle action. Lightweight and portable when not in use and also ideal for use in the workplace.